We know a lot about moving . . . Read these useful moving tips before your move and learn from our experience. Plan – buy a notebook or folder and keep all of the details of your move in one place. Declutter – Moving gives you a great opportunity to declutter, why move things you’ll never use? Discard broken or unnecessary items and re home other items to a worthy cause. We work with local charities so can always help with this. Create an inventory – this is the perfect time to make a detailed list of your belongings. Your inventory can also be used to help value your insurance coverage and keep your packing organized. Contact your building management/security team at both your current and new property so you can reserve freight elevators and make sure your chosen moving day works equally well for both locations. Check if you need any permits or additional permissions. All permits and a list of contact details will need to be provided to your Move Coordinator 48 hours before your move day. Every move will have a designated team leader – please request a walk through of your property before and after packing to everything is clear. This will avoid confusions throughout the day and help ensure everything runs smoothly. Utilities – DO NOT turn your electricity off until after your move is complete. Working in extreme temperatures will slow our moving team down. Personal Care – Please ensure there is a toilet available for our moving crew to use. Order boxes – If you are packing your self make sure you have enough boxes and supplies for your big day! Pack in advance – Any items you do not use, get packed. You will be far more relaxed on the day if you have made a start. Remember to place heavier objects at the bottom and make sure that your boxes aren’t too heavy for someone to lift. Remember Move One are happy to pack and unpack for you. 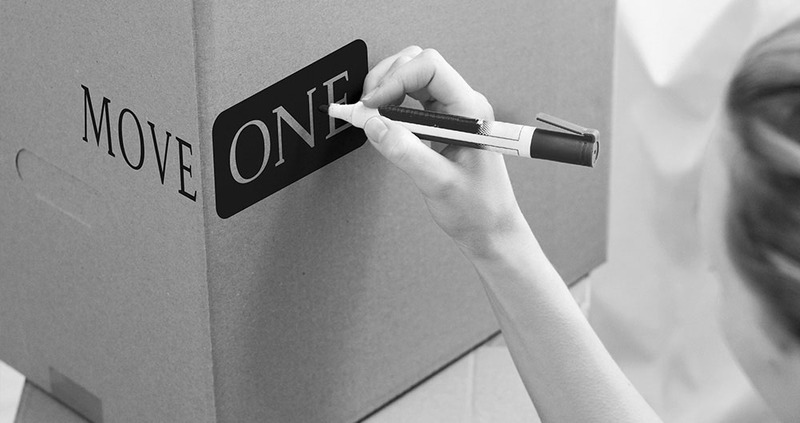 Mark your boxes clearly – It helps everyone if your boxes are market clearly on the outside. New Contact details – This is very important and can be planned ahead of your move day. Make a list of all credit card and utility companies, newspapers, and Internet and cable providers and create template to send out with your new details. Important items – Make sure any jewelry, phones, laptops, chargers, prescriptions, glasses etc. are all accessible and in a safe place on your move day. Lean on your friends – having children and/or pets around on move day adds to any stress. Play dates are perfect on move day! Take Out Menus – At the end of a long day you will be starving! Keep a selection of take out menus with your moving plan so you can quickly order for you and/or your family. Moving Internationally requires additional planning and understanding. Our customers tell us they appreciate our honest advice. There are some elements of your move that are out of the control of any moving company and it is important to listen to our advice and beware of processes which includes customs/import/export guidelines prior to your move. IMPORTANT DOCUMENTS – DO NOT pack any important travel documents, keys, passports, prescriptions, glasses etc – you will need these items before your shipment arrives. Put them in your carry-on luggage in advance of your move day. INSURANCE – Make sure you have completed a concise inventory and you understand your policy. Making claims after your move is a lot easier if you have all the correct documents.